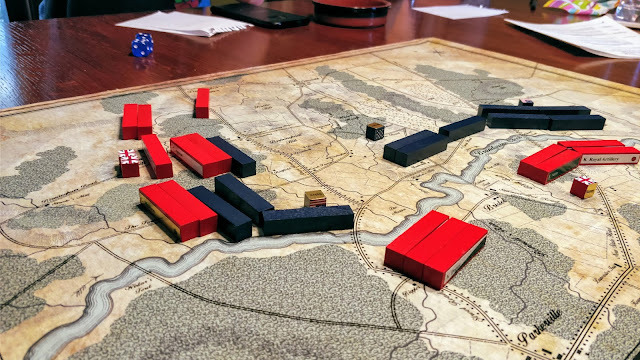 This weekend we had my kids and my son's fiancee over and along with my wife, played a five-player game of Pub Battles: Brandywine using the "Role Playing Wargame" rules. My future daughter-in-law commanding Sullivan's wing and my wife commanding Greene's wing preparing for battle. General Washington (my daughter) was letting the dog out. I've been wanting to try a multiplayer game of Pub Battles and the family seemed willing. 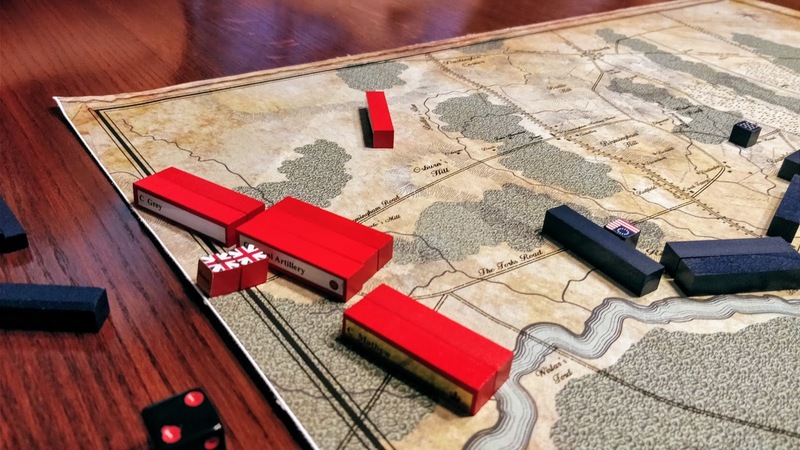 Pub Battles and Sails of Glory have proven to be powerful gateway drugs for my wife into wargaming, along with a couple of trips to Origins. Cornwallis and Howe enter on the Continental right as they did historically. I took the main British corps while my son handled Knyphausen. I'm reading about the Philadelphia campaign and am planning a trip to Germantown and Brandywine in October. It was a little daunting for the new players to get their heads around a type of game they'd never played before and deal with written orders and deployment instructions. Nonetheless a good time was had by all. We all read the orders that were written after the game was over and had a good laugh at how things had turned out. My daughter as Washington in particular found out that it was very important to be specific and exact in her instructions! There was quite a bit of confusion on the Continental side, particularly at the beginning of the battle. The rules for a multiplayer game worked very well. As expected in a Kriegsspiel style game, particularly with novice players, there was a lot of confusion and misinterpretation. My son followed orders very well - probably too well. 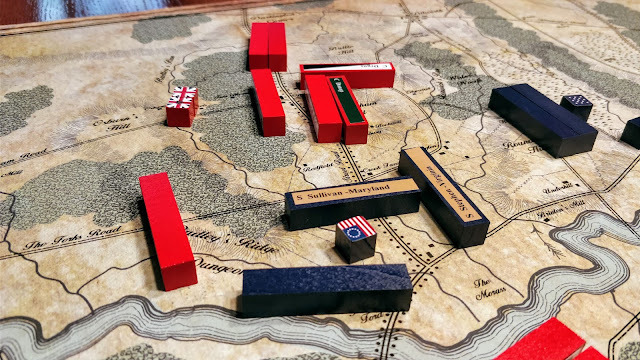 Without explicit instructions to use his artillery to soften the way at Chad's Ford he sat staring at his opponent Greene for four turns before finally launching a late attack that didn't have time to achieve his objectives. That was my fault - I'd failed to give him instructions during his deployment as to when to attack, and then the distance between Howe and Knyphausen was such that all subsequent orders were subject to a two turn delay. The Continental Army with interior lines was subject to just a one turn delay and able to react faster. I should have also road marched Cornwallis behind Sullivan to get into action faster. As it was, the game was a draw. 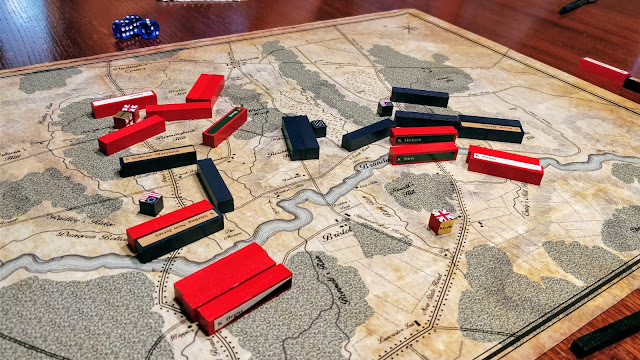 Brandywine is just a five turn game. 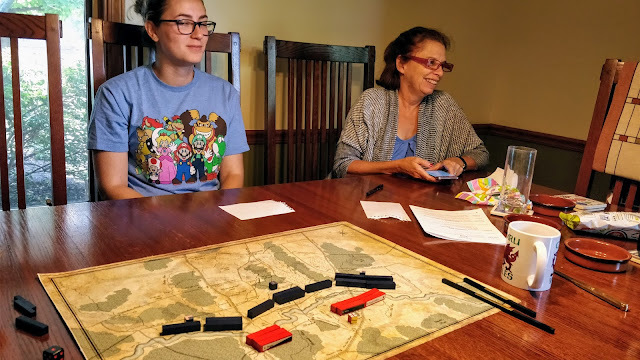 On the one hand, this makes it ideal for a Kriegsspiel style experience with novice or casual players: a more formal Kriegsspiel game can last many hours and takes some dedication. From start to finish, including learning how to play the game, we were done in less than two hours. On the other hand, five turns goes fast with order delays of a turn or two. Each turn is supposed to have an orders phase at the beginning, to read incoming orders and write new orders. There's also a phase at the beginning to write initial orders/deployment instructions. We skipped the turn one orders phase because we'd just done the initial orders and deployment. That meant that the Continental Army received no new orders until turn three and the British until turn four. There may not be a ton of orders to be written or sent until turn two in most cases, but in our case, where both sides did a less than stellar job with their deployment instructions, it would have been useful to send new orders on turn one. 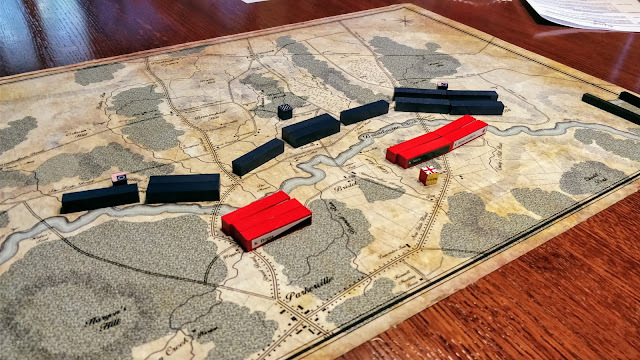 Playing Pub Battles this way would be ideal for a school history class or as an exercise on team communications. It's fast to teach and complete. There are immediate and visible effects from writing unclear orders. It was certainly fun! My future daughter-in-law even said she liked it more than Sails of Glory, which really surprised me. Hopefully this game leads to future family wargaming and maybe even some multiplayer Pub Battles at Origins next year.